Pamela Ashburton's dreams of a London Season meet with disaster at her very first ball. When her humiliation is exaggerated by the caustic attitude of her mother and sister, she goes to live with her aunt in Worcestershire. Four years later, she is well on her way to spinsterhood. Will Forsyth, a veteran of the Peninsular War, retreats to Worcestershire in hope of a quiet, solitary life that will heal more than his physical wounds. But it's the Christmas season, and when Pamela requests Will's help to find mistletoe for her aunt's Twelfth Night ball, what's an officer and a gentleman to do? "Ms. Bancroft weaves a magical story of two people destined to be lonely souls until mistletoe and the magic of Christmas season finds these two and brings them together. This short little quick read had me wrapped in the warmth of the characters. . . . Ms. Bancroft writes a story that pulls you, the reader, into it and doesn't let you go. . . . This quiet love story gently sweeps you off your feet and leaves you wanting more. A must read for the romantic in all of us." Regency rules and taboos in early 1800s stifled individuals that didn't abide by dictates of Society, but strong personalities seem to find their way to survive and thrive. While Pamela and Will may be "Two self-made Pariahs", they whet each others interest and enjoy "conversation without obligation or insinuation" in the isolation of an enchanting country glade. The humor that under-girds this story makes it delightfully captivating. The characters, well-developed for a short novella, depict the diversity of the people in the community. . . .
Best of all, the hero and heroine, ignoring social pressures, find a joy in life as they search for mistletoe, survive the surprise of the 'fallout' of the adventure, and take control of their own lives. The climax at the Twelfth Night Ball makes the heart sing with joy. 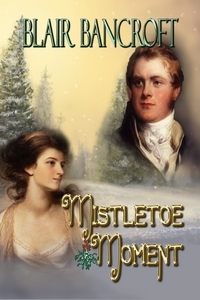 Mistletoe Moment is incredibly entertaining- a short and sweet, enchanting love story.